Dave is now engaging in his community more, visiting local businesses and eating out at restaurants. He is always amazed when he asks Nic to “kennel under the table,” then after dinner when Nic moves out from underneath, people are surprised because they did not know the service dog was there. Nicodemus is already giving Dave the confidence he has been yearning for to be comfortable in public. If struggling while out, Dave is confident that with Nic by his side, he can get through whatever he encounters. Nic is always focused on Dave and waiting for the next need he will have. When you shop the Pets & Vets collection on iHeartDogs.com, part of your purchases help make happy endings like this one possible! 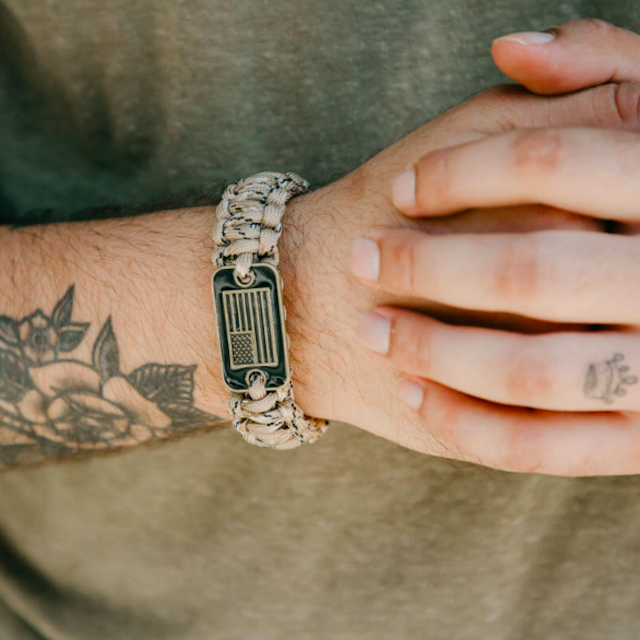 Desert Camo Paracord Bronze Flag Bracelet: Helps Pair Veterans with a Service Dog or Shelter Dog, $19.99. 20% of sales are donated to help pair veterans with shelter or service dogs.